Trauma care is hectic by its very nature. But in hospitals, where a minute lost to disorganization and miscommunications can make the difference between life, death or an extended stay, even the tiniest of extraneous disruptions can turn into a huge problem. Trauma bays and operating rooms are designed to run as smoothly as possible, but inefficiencies still plague the system. Cedars-Sinai Hospital in Los Angeles partnered with the Department of Defense to build out the OR360, a new innovation center where doctors and military personnel can simulate hypothetical scenarios in order to simplify and streamline trauma care. The logic here is simple. The faster you care for a patient, the more likely he or she is to survive. These “flow disruptions,” things like poorly organized equipment and lack of communication between team members, can be hugely detrimental to a patient’s health. 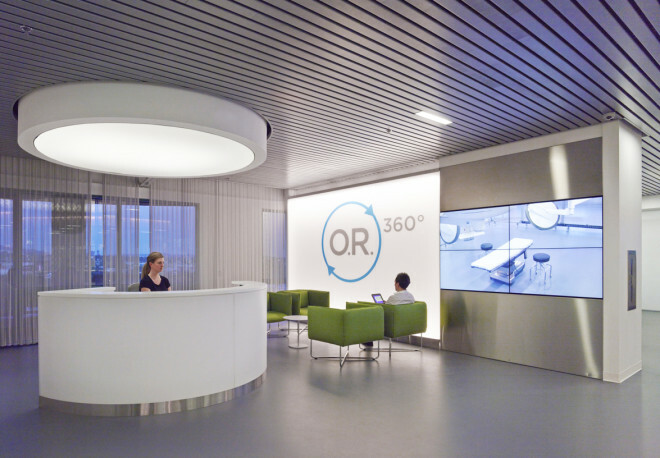 The OR360, then, is a place to work out the kinks and try out new ideas and workflows. After all, it’s hard to beta-test solutions in a real operating room. The OR360 space takes up an entire floor in an old medical office building off the main Cedars-Sinai campus. It’s part meeting space for brainstorm sessions, part simulation center. Of course, simulation is common practice at hospitals. But while most simulation spaces aim to be a mirror of actual operating rooms, OR360 prides itself on its ability to undergo chameleon-like transformation. 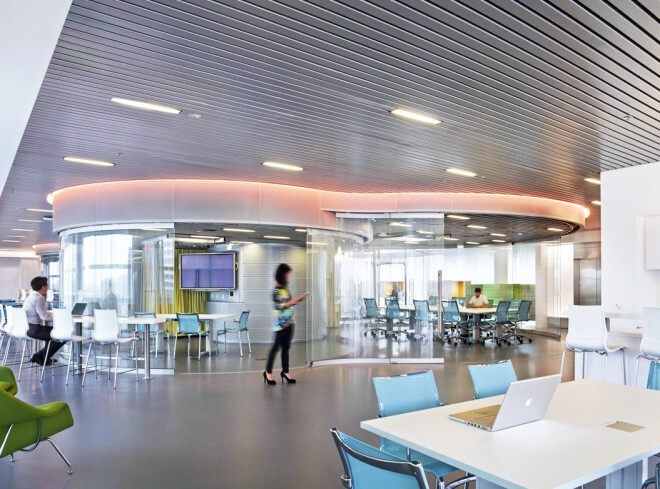 CannonDesign designed the space to be endlessly reconfigurable, by implementing a gridded trolley system on the ceiling that allows the surgical lights, equipment booms and the glass walls to be repositioned or removed altogether. 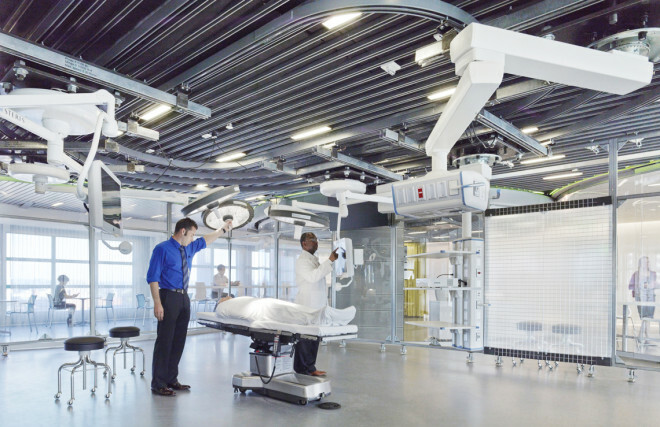 “It’s no different than the erector sets where everything could be screwed, unscrewed and changed very quickly without having to be an engineer,” says Carlos Amato, Healthcare Design Leader for CannonDesign. Cedars-Sinai staff began using the OR360 earlier this year, and since then they’ve turned it a battlefield OR room, they’ve brought in a Hollywood set designer to remake it into a bedroom in order to test an on-patient drug delivery system, and they’ve simulated a simultaneous fire and earthquake scenario to see how doctors would react. “We can set up complex scenarios that we might wait for a long time to see in emergency department in real life,” says Catchpole. ◾Color-coded trauma bays, which reduce confusion and friction between team members who need to grab equipment. ◾Whiteboards in trauma bays that display key information about patients before they arrive via ambulance and conducting pre-briefings. ◾An iPhone app with patient diagnostic data (blood pressure and vital signs) that will be used hospital wide to disseminate data to various teams of doctors. These seem like fairly obvious improvements, but keep in mind this was all stuff that didn’t exist prior to opening the simulation center. For what it’s worth, the whiteboards and pre-briefings reduced the time to capture first radiological images by more than 10 percent and the time to draw blood for first lab tests by more than 20 percent. The standardized, color-coded trauma bays reduced the time needed to collect supplies by about 15 percent. Robert McDonald, the former Procter & Gamble chief executive and President Barack Obama’s pick to lead the Department of Veterans Affairs, has been strongly endorsed by all members of the Senate Committee on Veterans’ Affairs. At his nomination hearing yesterday, McDonald said he would apply his experience with information technology and leadership both in the Army and at P&G to improve patient care, customer service and the disability claims system. A 1975 West Point graduate, McDonald said although he received an engineering degree, he also studied computer science. During his time at the academy, McDonald said he even wrote some basic computer code in assembly language. McDonald told the committee he viewed VA’s Veterans Health Information Systems and Technology Architecture, or VistA, as “world class” and said he wants to develop an “equally world-class [patient] scheduling system” to replace the Electronic Wait List system. That system, first deployed in 2002, has been the root cause of delayed treatment for veterans across the country and the ensuing investigations and scandal led to VA Secretary Eric Shinseki’s resignation May 30. McDonald also told the committee he has already met with Defense Secretary Chuck Hagel — at Hagel’s request — to ensure veterans do not encounter unnecessary barriers as they transition from active service to veteran status. McDonald said this should include a compatible electronic health records system, which the two departments had pursued for years and then canceled in February 2013 because of extreme costs. Since then, DOD and VA have pursued development of their own health records based on the concept that key information can be transferred between the two by using a system to exchange standard clinical health data. That will allow the departments to develop a single, shared electronic health record without having to build a joint system from scratch. McDonald told the hearing some advances have been made on compatible DOD-VA record systems, but based on what he knows from public accounts, “more progress needs to be made,” he said. He said he will then embark on a nationwide tour to meet top VA managers and front-line employees to emphasize the need for a veteran-focused operation conducted with the highest level of integrity and honesty. Numerous committee members expressed frustration that for years, they experienced problems in receiving speedy responses to their oversight queries. Early on in the hearing, which stretched to nearly 2.5 hours, McDonald said he would solve that problem by providing each member of the panel with his personal cell phone number to call if they had problems. Sen. Mazie Hirono, D-Hawaii, said this would make McDonald, if confirmed, the first VA secretary to make such an offer. At the tail end of the hearing, Sen. Jay Rockefeller, D-W. Va., said he and his staff also needed quicker responses to their questions — and added a caveat that McDonald needed to be assertive in his dealings with the committee. McDonald, who repeated his offer to provide members with his personal cell phone number, then requested Rockefeller’s number. Rockefeller, however, did not reply to this show of assertiveness as the hearing camera lingered on his frustrated grimace. The easiest part about the job of the next Secretary of Veterans Affairs may be getting it. 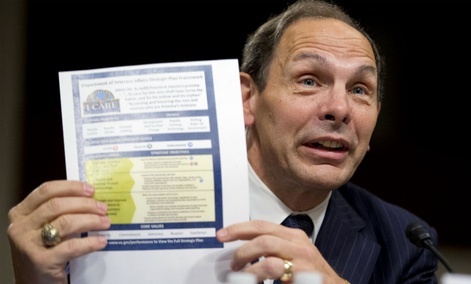 The Senate Veterans Affairs committee on Tuesday gave unanimous support to former Procter & Gamble CEO Robert McDonald to serve as VA secretary, green lighting President Barack Obama’s nominee, who is expected to be confirmed before Congress leaves for its August recess next week. But more than 50 days since former VA Secretary Eric Shinseki resigned in the wake of a still-growing scandal over wait times at VA health facilities, McDonald’s confirmation is just one, albeit significant, step forward for the Sisyphean effort he is set to soon lead: fixing a VA broken in both spirit and function. “For me, taking care of veterans is personal. I come from and care deeply for military families,” McDonald said at the hearing, describing himself as a “forward-looking leader.” McDonald is an Army veteran and graduate of West Point, but it’s his business acumen that distinguishes him from the string of military officials who have served before him in the cabinet post — a welcome departure that many say is badly needed as Congress attempts to overhaul the behemoth $163 billion agency. “You come to this position with heightened scrutiny because the issues affecting the veterans administration of course do not go away with a change of leadership at the top,” Sen. Mazie Hirono, D-Hawaii, said. “There are a lot of issues facing the VA, but I think people will want to pass Mr. McDonald right now,” committee chairman Sen. Bernie Sanders, I-Vt., told Defense One on Monday night, saying that no one had raised any specific concerns with him about the president’s pick to replace Shinseki. “I hope very much the hearing goes well and that he gets the votes he needs to get into his new job before the August break.” Sanders said the committee will formally vote Wednesday to pass McDonald’s nomination to the Senate. Early momentum in Congress to respond quickly to the crisis with a sweeping VA reform bill has ebbed in recent weeks, replaced by intransigence over the estimated price tag of $30 billion per year beginning in 2016, according to the Congressional Budget Office. The Senate early last month overwhelmingly passed a $35 billion VA reform bill using emergency funding “as a cost of war,” according to Sanders. The Senate bill closely followed the House’s unanimous passage of a similar measure to address wait times and accountability — but offsetting the cost. Lawmakers’ pledged to have a bill ready for Obama’s pen by the July 4 recess, but the bipartisan committee charged with hammering out the differences between the two chambers’ legislation quickly became jammed over the question of how it should be paid for. Sanders reported a breakthrough in negotiations Monday night, with senators agreeing to include some budget cuts to offset the final bill. He said he expects to “end up with” final funding substantially less than what the Senate voted for. At the hearing Tuesday, Sen. Jerry Moran, R-Kan. — the first senator to call for Shinseki’s resignation — went so far as to suggest that senators not adjourn for the August recess before reaching a conclusion on the legislation. Despite the progress, Majority Leader Sen. Harry Reid, D-Nev., expressed cynicism that the VA bill will pass. Acting VA Secretary Sloan Gibson — who just last week told Congress the embattled agency would need some $17 billion more over the next three years to meet demand and cut down on wait times — followed the vice president at the Veterans of Foreign Wars conference on Tuesday and said McDonald is the man for the job. While expressing unanimous support for McDonald, committee members questioned him on potential solutions to the long list of problems plaguing the VA, such as wait times; manipulating data; inconsistent care, particularly on mental health; bureaucracy; perverse incentives and retaliation against whistleblowers. McDonald laid out his broad plan for “immediate actions” if confirmed, including asking employees to bring forward any concerns, getting out in the field, restructuring employees’ performance metrics and reorganizing the department. The Senate Veterans’ Affairs Committee voted 14-0 on Wednesday to confirm McDonald as VA secretary. By Molly O’Toole // Molly O’Toole is the politics reporter for Defense One. O’Toole previously worked as a news editor at The Huffington Post. She has covered national and international politics for Reuters, The Nation, the Associated Press and Newsweek International, among others, from Washington, New York, Mexico City and London. She received her dual-masters degree in journalism and international relations from New York University and her bachelor’s from Cornell University. Allison Hickey, under secretary for benefits, Department of Veterans Affairs, testifies before the House Committee on Veterans’ Affairs.Allison Hickey, under secretary for benefits, Department of Veterans Affairs, testifies before the House Committee on Veterans’ Affairs. 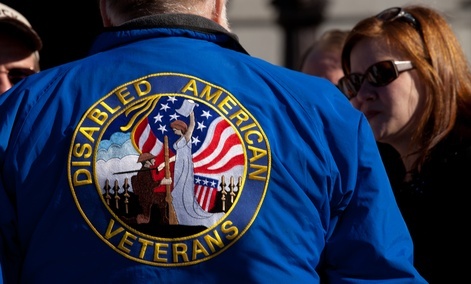 WASHINGTON — The Department of Veterans Affairs says it has made “tremendous progress” in reducing a disability claims backlog that reached above 600,000 early last year. Members of Congress and the department’s assistant inspector general don’t believe it. In a report issued earlier Monday, Halliday said that in its rush to reduce the backlog of disability claims, the VA has made benefits payments of more than $85 million to veterans who lacked adequate medical evidence that they deserve them. Without improvements, the VA could make unsupported payments to veterans totaling about $371 million over the next five years for claims of 100 percent disability alone, Halliday said. Special initiatives designed to remove older claims and speed processing of new claims are worthwhile, Halliday said, but in some cases they “have had an adverse impact on other workload areas” such as managing appeals filed by veterans and reducing overpayments to veterans. 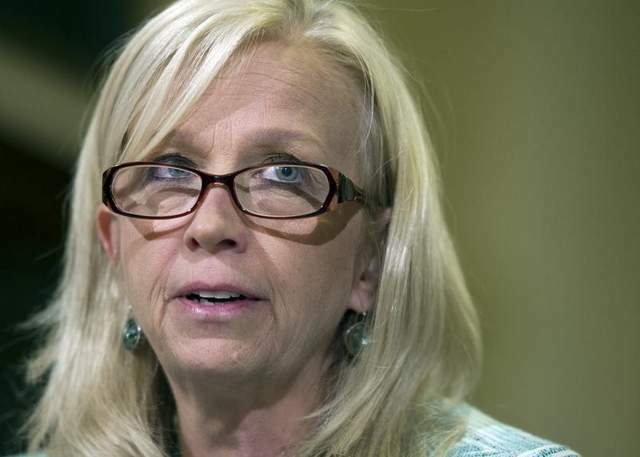 Hickey defended her agency, saying the department has spent the past four years redesigning and streamlining the way it delivers benefits and services to veterans. Last year, the Veterans Benefits Administration, which she oversees, completed a record 1.2 million disability rating claims, Hickey said. The agency is on track to complete more than 1.3 million rating claims this year and pay a total of $67 billion in benefits — about half the VA’s budget, Hickey said. More than 90 percent of the claims are being processed electronically, she said. The VA has long struggled to cope with disability claims. The backlog intensified in recent years as more solders returned from Iraq and Afghanistan, and as the VA made it easier for Vietnam-era veterans to get disability compensation stemming from exposure to Agent Orange. The VA has set a goal to process all claims within 125 days at 98 percent accuracy in 2015, but so far has fallen far short. The agency now processes most claims within 154 days — or more than five months — at a 90 percent accuracy rate, compared with an accuracy rate of 86 percent three years ago, Hickey said. At one point, veterans were forced to wait an average nine to 10 months for their disability claims to be processed. “It has never been acceptable to VA … that our veterans are experiencing long delays in receiving the benefits they have earned and deserve,” Hickey said, adding that she was “saddened and offended” by related problems that have plagued VA health centers in recent months. Investigators have found long waits for appointments at VA hospitals and clinics, and falsified records to cover up the delays. Inspectors also found evidence that staffers at the Philadelphia regional office were manipulating dates to make old claims appear newer. The findings are similar to problems in which investigators have found long waits for appointments at VA hospitals and clinics, and falsified records to cover up the delays. In Baltimore, investigators discovered that an employee had inappropriately stored in his office thousands of documents, including some that contained Social Security data, “for an extensive period of time.” About 8,000 documents, including 80 claims folders, unprocessed mail and Social Security information of dead or incarcerated veterans, were stored in the employee’s office, Halliday said. Hundreds of thousands of disability claims filed with the Department of Veterans Affairs’ eBenefits portal launched in February 2013 are incomplete and could start to expire this month, Nextgov has learned. VA Undersecretary for Benefits Allison Hickey touted the new portal in June 2013 as simple as filing taxes online and a way to whittle down the claims backlog. “Veterans can now file their claims online through eBenefits like they might do their taxes online,” she said, including the documentation needed for a fully developed claim in cooperation with Veterans Service Organizations, or VSOs, such as the American Legion or Veterans of Foreign Wars. Gerald Manar, deputy director of the National Veterans Service at VFW, told Nextgov the Veterans Benefits Administration on June 26 briefed VSOs on problems with the eBenefits portal, including the fact that only 72,000 claims filed through eBenefits have been completed and approved since last June, with another 228,000 incomplete. VA spokeswoman Meagan Lutz said since February 2013, just over 445,000 online applications have been initiated. Of those, approximately 70,000 compensation claims have been submitted and another 70,000 nonrating (add a dependent, etc.) have been submitted, leaving a total of 300,000 incomplete claims. Because a number of claims started are more than 365 days old, they have now expired, totaling an estimated 230,000 unprocessed claims. Manar said he still is trying to understand why so many vets did not complete their online claims and whether they opted to file a paper claim. Lutz said an important element of the electronic claim submission process is the ability for veterans to start a claim online with limited information to hold a date of claim, while simultaneously providing 365 days to collect data, treatment records and other related information. Lutz said a veteran simply hits “save” and any information provided is saved in temporary tables. During that 365-day period, a veteran may add additional data or upload documents associated with that specific claim. At any point during that timeframe, a veteran can hit the “submit” button and a claim will be automatically established within the Veterans Benefits Management System, designed to entirely automate claims processing by next year, and documents will be uploaded to the veteran’s e-folder. After 365 days, Lutz said, the data is made inaccessible and the initiated claim date is removed from the system. The system was designed to provide the veteran as much flexibility as possible in preserving that start date as well as support the Fully Developed Claim initiative, which gives the veteran the opportunity to accrue additional benefits for providing all the data needed to rate the claim. VSOs have little visibility into the claims filed to date through the eBenefits portal because of design problems with the information technology system set up, the Stakeholder Enterprise Portal, Manar said. That portal only allows for broad searches for claims at the state and the VBA regional office level, and limits any search to 1,000 claims. If the search results in more than 1,000 records, SEP returns a message that the system is not available, rather than the search went over the 1,000 file limit, Manar said. SEP is also not set up to notify VSOs when a claim is filed through eBenefits, nor does it provide alerts when claims are due to expire, Manar said and urged VA to fix SEP to provide such notifications. Lutz said VA SEP design team is working as quickly as possible to help VSOs to review more than 1,000 files in SEP without getting an incorrect error message. She said VA plans a new release of SEP this month to VSOs, which will allow VSOs to submit claims directly to VBMS for veterans who hold power of attorney. This update would eliminate the need for the veteran to submit from the eBenefits portal. “This, we believe, will be a major milestone in the VSO community that will accelerate acceptance of the electronic process,” Lutz said. A text-messaging trial targeting high-cost Medicaid patients in New York has found that the interactive mHealth tool significantly improved patient adherence to medications, doctor appointments and care plans. The project proves the value of patient engagement programs for high-cost, underserved populations. One of its organizers said it will next be introduced to larger Medicaid populations. The trial, conducted by Montefiore Medical Center’s Universal Behavioral Associates and supported by a $100,000 Pilot Health Tech NYC grant, targeted 67 patients and 15 care managers involved in MMC’s Medicaid Health Home. Using a mobile care management program developed by New York-based Sense Health, the two-month project reportedly resulted in a 40 percent increase in self-reported adherence to appointments, a 12 percent increase in medication adherence and a 7 percent increase in reaching care plan goals. The Sense Health platform develops interactive, text-message-based support plans that are shared between patients and their caregivers. They’re designed to help patients take control of their own health management by providing information, advice and encouragement – all key components of a successful patient engagement strategy. That strategy will now be developed by Sense Health in partnerships with Medicaid Managed Care Organizations. A survey of the project’s participants found that they were 21 percent more motivated, 26 percent more confident and 22 percent more knowledgeable about lifestyle changes recommended for their health when using the Sense Health platform, according to officials. What’s more, tailoring health interventions and the support of care managers can help providers encourage people to take more accountability for their own health, added added Fred Muench, MD, a Sense Health advisor and member of the Columbia University College of Physicians and Surgeons, in the press release.